Tomato season is upon us and their beautiful bounty is on display everywhere!! I picked up a couple bunches of cherry tomatoes on the vine from the St. Lawrence Market this weekend and thought I would try something different with them. They are perfect and sweet right from the vine and tossed in a salad, but I wanted to give them a twist this weekend. This recipe is so easy to make and will taste even better the day after you make it. 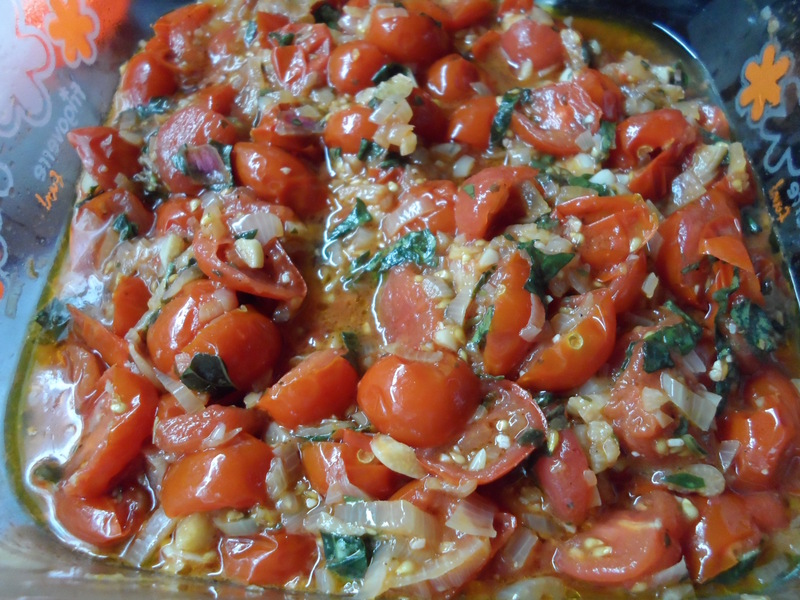 It’s also a great way to use up some of those tomatoes that may be getting a bit over ripe. I finely chopped my shallots and garlic, but if you prefer a chunkier version, then by all means chop them up a bit thicker. I love the smell of onions and garlic as they begin to gently simmer in a pan. What you add next can only be enhanced by their flavour. If you prefer a stronger garlic flavour, add a few more cloves. If you like more of a kick then you can crank that pepper mill a few more times, or maybe you would prefer a pinch of chili flakes for a bit more heat? This is such an easy recipe that you can easily adapt it to whatever flavour you prefer. Just keep it simple (one of my biggest problems)! 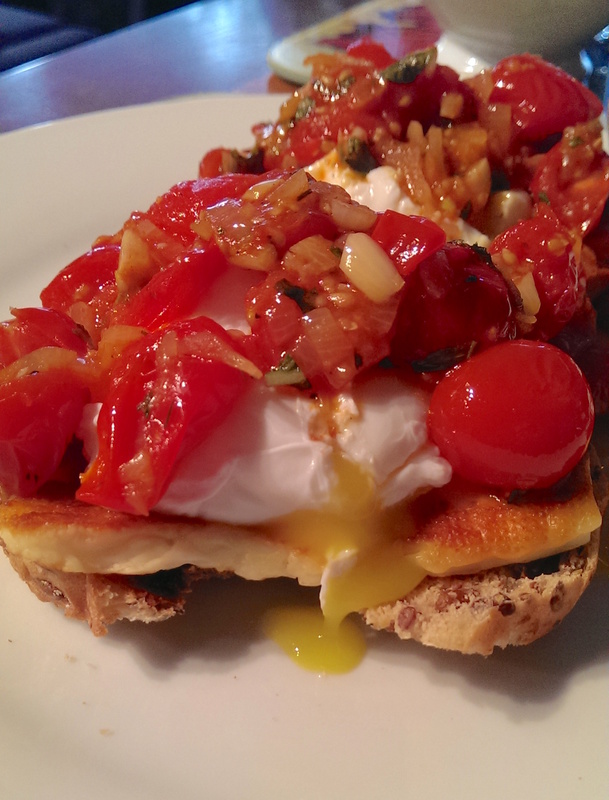 This is wonderful on poached eggs. 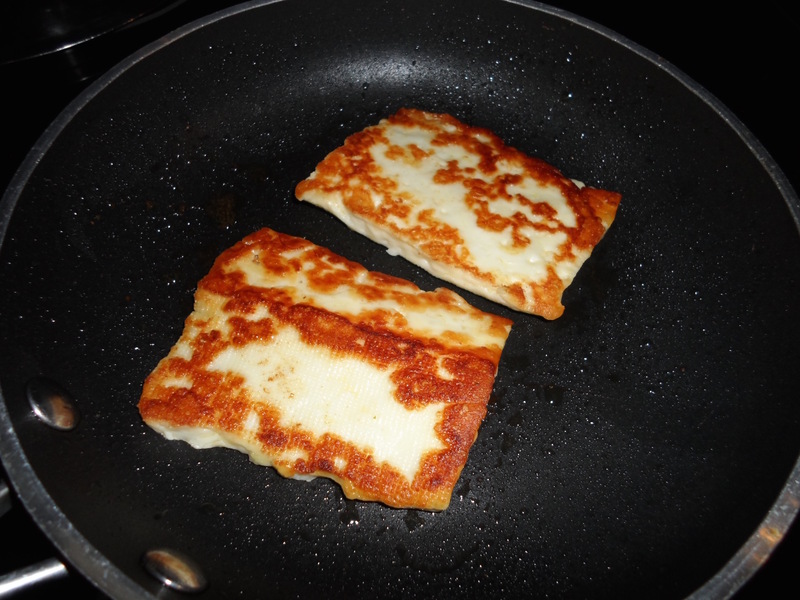 I had some for brunch the following day and had fried up a bit of Halloumi cheese. 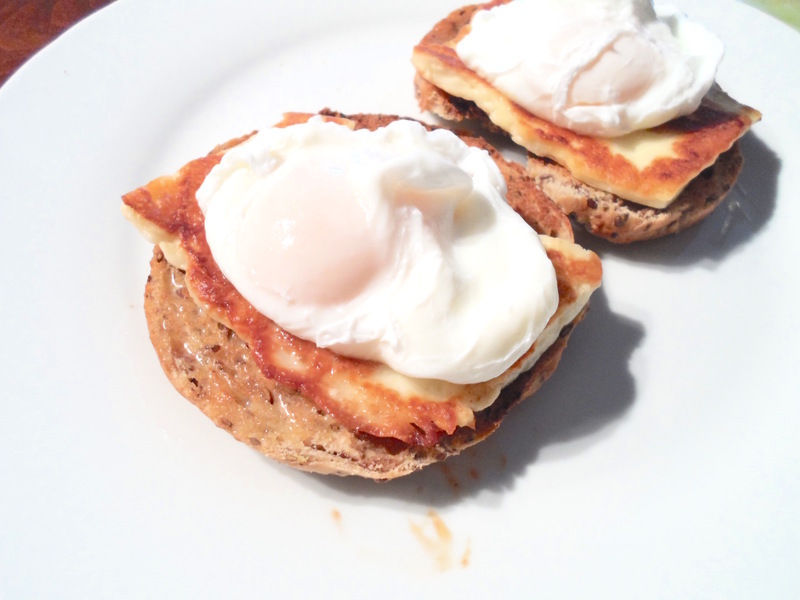 I then put the cheese on a slice of toasted bagel, the poached egg on top and spooned on some of the warmed up vinaigrette. Who needs ketchup on eggs when you have a bowl of this tasty topping. This would be great on pizza, salad, grilled chicken or veggies… the possibilities are endless! Cut cherry tomatoes in half and set aside. Heat 30 ml (2 tablespoon) olive oil in a medium saucepan over medium heat and add shallots. Cook, stirring often until softened, about 3-4 minutes. If saucepan seems a bit dry, add another 15 ml (1 tablespoon) of olive oil. 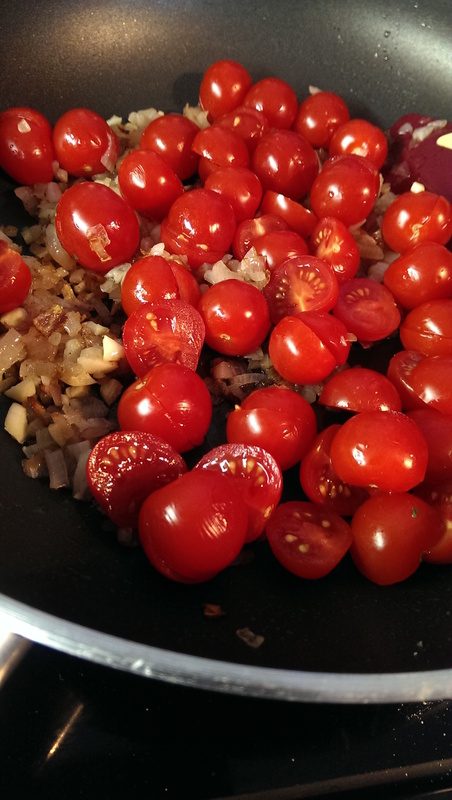 Add chopped garlic and cherry tomatoes and cook, stirring occasionally, until the tomatoes begin to release juices, 4–6 minutes. 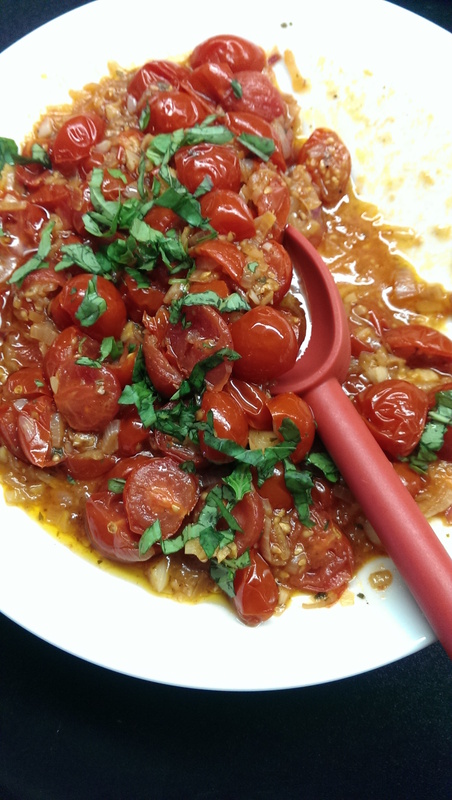 Mash some of tomatoes with the back of your stirring spoon. Add 30 ml (2 tablespoons) cider vinegar; season with salt and pepper. Remove saucepan from heat and stir in fresh chopped basil. If vinaigrette is too thick, add a bit more olive oil once you remove the saucepan from heat. Vinaigrette can be made a couple days ahead. Chill before you cover. Bring to room temperature or warm it up again before serving. Posted in breakfast, recipes, sauces, Tomato, vegetablesTagged breakfast, garlic, recipes, sauces, tomato, vegetarianBookmark the permalink.